As if the genre “cat” was established in the world of painting, pictures of cats are produced one after another in the world. There are plenty of cute pictures of cats. 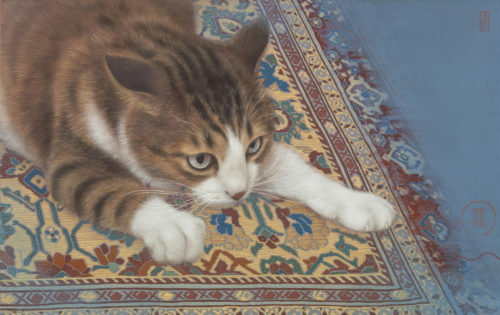 Among them, a Taiwanese painter, Chen Pei Yi’s cats are really alive. The small beast surely live in the picture. Will this cat jump to the target in 1 second, or will she leave abruptly? Her new work “Alert” has a tense atomosphere. Joint exhibition with Ikenaga Yasunari in November 2017 will be the first exhibition in Japan. 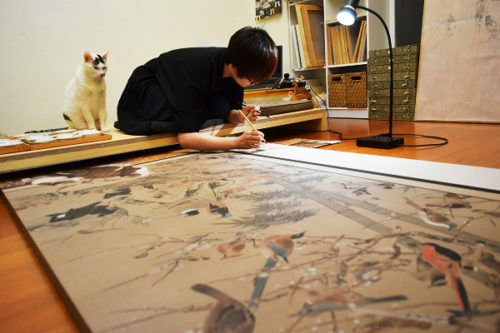 Ikenaga has been paying attention to Chen, who is 33 years old and draws cats with the technique of Japanese style painting. Although Chen was at a loss as to whether to become a teacher, she met the mineral pigment then felt the fun of creation and the possibility of her own painting. When placing pigment on silk, color layers overlap and gradually spread with moisture. To stick out the paint on the surface, also paint from the back side. Through these process, the surface of picture keeps thinness and lightness, but has the definite presence. It matches the theme of Chen that draws fine and soft subject matter graphically. She tried technique to rework one line many times over and over, and tried difficult materials. The repetition of practice in her student’s days supports surprisingly detailed depiction, such as carpets and cats.